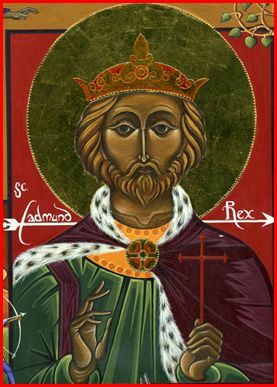 A reconsideration of the history and legend of St Edmund, last of the famous Wuffing kings of pre-Viking East Anglia and a patron saint of England. Our primary source is that Old Testament of English history, The Anglo-Saxon Chronicle, wherein the entry concerning Edmund’s death on 20th November, 869, imply that he was may have been killed near Thetford in battle against the Danish micel here, 'Great Army', led by Ivarr the Boneless and his brothers, sons of the semi-legendary Ragnarr Lothbrok. We shall assess these near-contemporary entries in relation to the huge quantity of later legendary material, especially Abbo’s Passio Sancti Edmundi and the stirring Old English version by Ælfric. We shall also chart the rise of the cult of St Edmund and consider the extent to which he may still be regarded as a patron saint of England. Dr Sam Newton is an independent historian who has lectured widely around the country and as well as contributing to many television and radio programmes. In 1993 he published his first book, The Origins of Beowulf and the pre-Viking Kingdom of East Anglia, now in its fourth print run. His second book, The Reckoning of King Rædwald, was published in 2003. He is also a Director of Wuffing Education at Sutton Hoo and regular Time Team historian. Garmonsway, G., The Anglo-Saxon Chronicle (Dent 1975). Hart, C., The Danelaw (Hambledon 1992). Gransden, Antonia, "The legends and traditions concerning the origins of the Abbey of Bury St Edmunds" English Historical Review, 100 (1985), pp.1-14. Plunkett, S., Suffolk in Anglo-Saxon Times (Tempus 2005). -------------, King Alfred the Great (Oxford 1995). Whitelock, Dorothy, "Fact and Fiction in the Legend of St Edmund", Proceedings of the Suffolk Institute of Archaeology and History, 31 (1970), pp.217-233.